As recent testimony before the 9-11 Commission shows, when it comes to espionage, terrorism, and strategic planning, it's difficult to tell who's working for whom, who's telling the truth, whose actions are morally justifiable, and whose are not. With its current production of Tom Stoppard's classic spy thriller, Hapgood, Miners Alley Playhouse revisits this shady ground in the context of the Reagan-era Strategic Defense Initiative (SDI), the so-called "Star Wars" program. 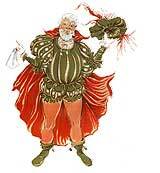 As we've seen in Rosencrantz and Guildenstern are Dead (Probability Theory), and Arcadia (a famous mathematical theorem), Stoppard has a knack for mixing drama and science, fantasy and fact. In Hapgood, he cleverly combines a cold-war whodunit with the famous two hole experiment that illustrates Heisenberg's Uncertainty Principle. Robert Kramer, and Wade Wood. Director Keith Dixon sets up the unpredictable nature of these parallel universes (spies and sub-atomic particles) with an entertaining prelude, moving his trench-coated, sun-glassed players in and out of doors on John Van Lennep's striking, brightly painted set covered with patterns resembling the photographic results from particle accelerator collisions. Choreographed to El Armstrong's edgy mix of police-band chatter and pop-music spy themes, spooks and black ops exchange briefcases in a sophisticated shell game that leaves everyone confused, including the British intelligence (MI6) agents who were in on the planning. At the center of this seemingly random pattern of cryptic interchanges and disinformation campaigns is Hapgood, the only female agent in the bunch. Paige Lynn Larson plays "Mother" (Hapgood's code name) to her network with aplomb, nonchalant as if the stakes were nothing more than a penny-ante poker game, yet revealing a vulnerability and inner turmoil in her personal moments. Never breaking his poker face, Wade P. Wood is the dapper, dry-witted Blair, an icy behind-the-scenes puppet master who, at the snap of his fingers, sends his men scurrying in all directions to make an exchange or set up the next scene. Kerner, a Russian-born physicist and spy, holds the key information wanted by both East and West. Played by Rob C. Kramer, he's a sophisticated, tastefully dressed, quick-witted fence-straddler, who patiently explains to his cohorts how to apply theoretical physics to the spy game. The final key player is Ridley, a shifty, cackling, sarcastic live-wire in the hands of Christian Mast, who manages to balance his character's quirkiness with a finely-tuned, analytical mind, as evidenced by his focused monologue detailing the competing nuclear capabilities of the Soviet Union and the United States. Despite the astounding technological advances in spy-ware available today, as well as the ever-greater media control over the spin of events, Hapgood holds up because it not only captures the squishy morals of the players, but does so in an entertaining and informative manner. 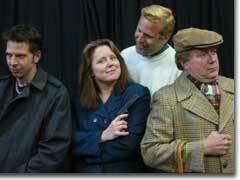 Miners Alley Playhouse's production of Hapgood runs through May 8th. 303-935-3044.